With tips on how to do a good show, through to advice on how to train a show horse, plus learning what to look for in a show jacket and tips on how to go about taking part in Search for a Star series, our ‘Showing Special’ feature has it covered. 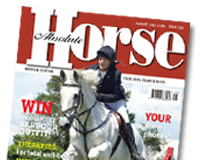 Plus we find out how to get your horse whiter than white in our grooming special and how your tack can enhance the best points of your horse’s conformation. Contributors include Katie Jerram, Sarah Emmerson, Clare Blaskey, Robert Walker and Ella Souster.